FIANNA FÁIL WILL seek to have the controversy surrounding John McNulty’s Seanad by-election nomination discussed in the Dáil later this week, calling on the Taoiseach to “to give a detailed explanation, outlining the entire sequence of events”. Earlier this week, Enda Kenny said “took responsibility for this having evolved to what people might imagine it is”. McNulty, a Dongal-based shop owner, was appointed to the board of the Museum of Modern Art Ireland (IMMA) just days before using this affiliation as grounds to qualify for the Seanad’s Cultural and Educational Panel in his nomination papers. Fianna Fáil leader Micheál Martin said this afternoon that “this controversy has gone on way too long and the Taoiseach needs to answer very fundamental questions that have been ignored to date”. The Taoiseach’s half-hearted apology on Friday has not cleared up the mess caused by the botched appointment of John McNulty to IMMA and his subsequent selection at the Fine Gael Seanad bye-election candidate. 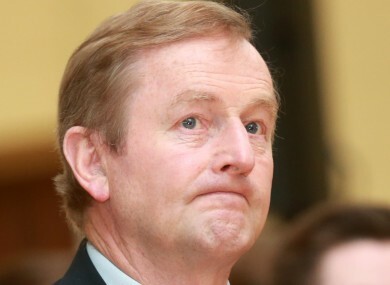 He added that he believes that Kenny owes both the IMMA and the Seanad “a fulsome apology”. Speaking to RTÉ’s The Week in Politics, Labour Junior Minister Kevin Humphreys noted that the opposition would have this opportunity to raise the matter further, but defended Kenny’s handling of the controversy. “What you have to accept is that the Taoiseach has very clearly accepted responsibility,” he said. He denied that Labour was giving Fine Gael “political cover” on this issue. He said he will be supporting John McNulty’s nomination. Humphreys was also questioned over a report in The Sunday Times that two coalition party councillors and a teacher from Enda Kenny’s home town had been nominated to the board of University College Dublin. He denied it was “cronyism”, and instead highlighted previous work by Labour councillor nominated for the role, Dermot Lacey, which qualified him for the position. The vast majority of appointments to state boards are advertised, Humphreys said, but UCD was simply an exception. Email “Fianna Fáil wants Enda to give the Dáil a "detailed explanation" of McNulty-gate”. Feedback on “Fianna Fáil wants Enda to give the Dáil a "detailed explanation" of McNulty-gate”.